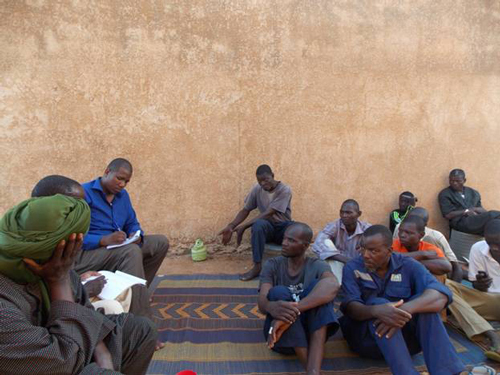 Seydou Abdoulaye of ROTAB in Niger meets with residents of communities impacted by the Samira Hill gold mining project. Photo courtesy of Seydou Abdoulaye. Last week at a workshop in Burkina Faso’s capital, Ouagadougou, coalitions from five African countries presented the results of their efforts to combine legal analysis of contracts with detailed on-the-ground monitoring of implementation and interviews with key government, community and mining company officials. Emmanuel Umpula of the Democratic Republic of the Congo told the audience that the monitoring efforts of Congolese organizations have opened up new opportunities for constructive engagement with mining companies. The Congolese government has published dozens of mining contracts, and Umpula’s organization, Action Contre l’Impunité pour les Droits Humains (ACIDH), is collaborating with the Plateform des Organisations intervenant dans le Secteur Minier (POM) to track the payment and use of social development funds at the massive Tenke Funkurume copper and cobalt mine. The contract calls for the mining company that runs the project (a joint venture including Freeport McMoRan, Lundin Mining and Gecamines) to pay 0.3 percent of its net proceeds into a social development fund to benefit local communities. POM and ACIDH found that the company complied with this obligation from 2009 to 2012, and that the funds had been spent on tangible projects—schools, bridges, wells—that have benefitted the mine’s neighbors. Their on-the-ground research revealed that while the social investments bore fruit, many local citizens were unaware of how the fund is managed or how expenditure decisions are made. POM and ACIDH were able to bring these concerns to the company, which has welcomed the intervention and has expressed enthusiasm for constructive discussion building on a shared understanding of obligations. Activists from Niger have been tracking the implementation of the Samira Hill gold mining project, which was managed by the Canada-based company SEMAFO until it pulled out earlier this year. Seydou Abdoulaye of the Réseau des Organizations pour la Transparence et l’Analyse Budgetaire (ROTAB) reported that terms from the contract and legislated rules regarding the health and safety of the project’s workers and neighboring citizens were not being vigorously enforced. ROTAB also found that while the company had adhered to an obligation to hire a large number of employees from Niger, the agreed-upon training programs to enable Nigeriens to assume senior leadership positions had not taken root. ROTAB and its partner—the Group de Réflexion et d’Action sur les Industries Extractives (GREN)—also discovered that payments required under the contract for training of mining ministry staff do not appear to have been made in a timely fashion. Most notably, the organizations found that the government’s ability to monitor mining projects across Niger was badly overstretched, imperiling effective and responsible implementation of the projects according to the established rules. Michel Bissou of the Network for the Fight Against Hunger (RELUFA) has monitored implementation of the C&K mining project in Cameroon. Conde Fanta Mamady and his colleagues at the Centre du Commerce International pour le Développement (CECIDE) in Guinea are monitoring extractive contracts amidst significant changes within the country’s mining sector. CECIDE and Publish What You Pay—Guinée are monitoring implementation of the large-scale Simandou iron ore mining project managed by Rio Tinto and Chinalco, where ambitious plans for large-scale infrastructure construction have suffered long delays. The organizations have been tracking the employment of Guinean citizens at the project, and said that with the delays in development the companies have released the majority of the employees who had been hired earlier in in its life cycle. Conde called on the Guinean government to push for firm application of the terms of Guinea’s new mining code in the Simandou project, which includes strong provisions for employment of Guineans. He also pressed for full transparency in the matter of how the government is spending or investing the $700 million payment it received from Rio Tinto in 2011. In Burkina Faso, the Organisation pour le Renforcement des Capacités de Deveoppement (ORCADE), Réseau Africain des journalistes pour l’intégrité in Burkina Faso (RAJIT) and Min’Alert are monitoring the hiring of national citizens the Essakane and Kalsaka projects, which are governed by the mining contract and national regulations. The companies are required to have staffs that are 75 percent Burkinabe; Jonas Hien of ORCADE reported that the companies managing these projects (including IAMGold Corporation for the Essakane project and Cluff Gold for Kalsaka) have complied with this obligation. This was an important finding for the country’s citizens, and Hien indicated that quantifying and sharing this information is improving public understanding of the project. ORCADE found, however, that the ranks of skilled and managerial positions in the projects are still overwhelmingly dominated by foreigners, and recommended that the state and the companies invest in long-term training. The project also found that many government officials who were responsible for monitoring the project had little awareness of the detailed terms of the contract, and were very interested in ORCADE’s efforts to publicize its terms and provide regular progress reports. The organizations gathered in Ouagadougou for a workshop on the new governance standard of the Extractive Industries Transparency Initiative (EITI), which includes an encouragement to disclose all oil and mining contracts. Revenue Watch shared its recently published global guide to the new standard, and participants shared their experiences implementing EITI and their goals for the new standard. The organizations who presented their project monitoring activities had in 2012 participated in training co-sponsored by RWI and the World Bank Institute on analyzing extractive industry contracts and using them as tools for strong enforcement. Over the course of the last year, each of them has put those concepts into action, and early results have been encouraging. The organizations have been able to bring shortcomings in enforcement to the attention of public officials and mining companies, and have been able to generate more effective discussion and follow-up by using public contracts systematically. For more information on how to monitor extractive projects effectively, see RWI’s report Enforcing the Rules, which provides tips on effective strategies for holding parties to their legal obligations. For the contract monitoring report released by civil society organizations in Cameroon, see Monitoring of Local Content and Fiscal Obligations of Mining Companies in Cameroon: Case of the Diamond Mining Project of Cameroon and Korea Mining Incorporation, Mobilong, East Cameroon. For details on other monitoring projects underway as part of this initiative, see RWI’s grant summaries for the Democratic Republic of Congo and Niger.